It can be risky business planning an outdoor wedding for the fall - Especially one that will be held beside the St. Lawrence River, exposed to all the wind and elements that might show up. But after a year of planning, and lots of prayers for sunshine, the wedding of Kelli and Dan was blessed with sunshine from start to finish. Kelli’s vision for her wedding day was quite clear from the start. Dan happily supported Kelli in all her bridal decisions but did insist on using the red Ramsey Plaid Tartan colors and the Ramsey and Curran Crests as part of the decor. 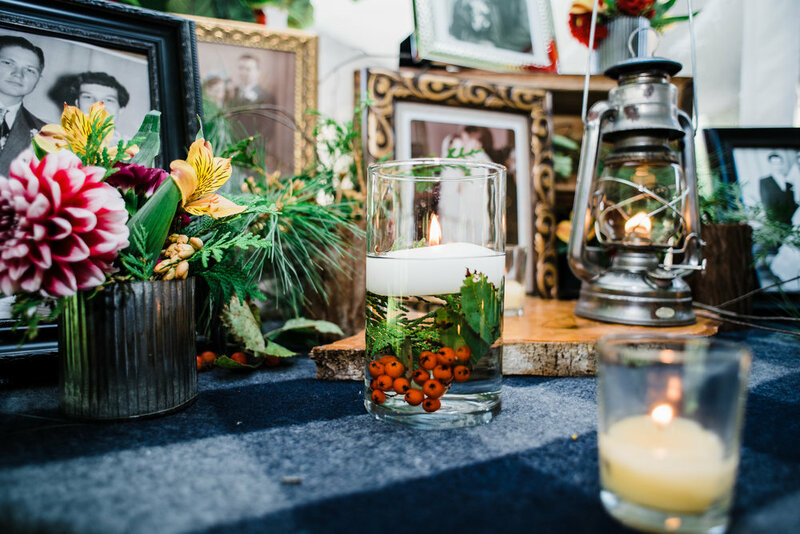 As active, outdoor enthusiasts, Kelli and Dan wanted a wedding that reflected their love for all things Adirondack, included family traditions and displayed an elegant, romantic atmosphere. Their preference for bold, rich “jewel” toned colors resulted in glorious floral combinations of red, burgundy, blue, orange, dark pink and gold. Wedding week found Team Perennia building the dream by organizing supplies, foraging for greenery, picking and prepping flowers, loading up and traveling to the Massena region to set up shop. 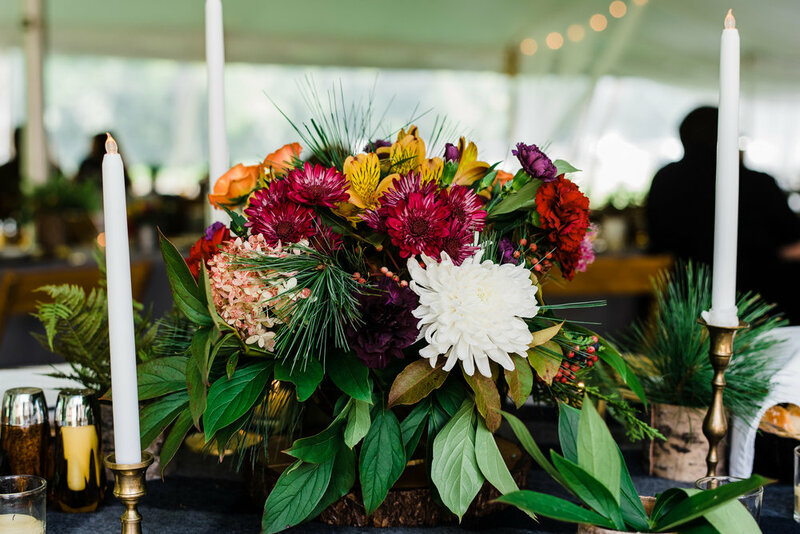 Based at Stonewall Farm, which is owned by our friend and floral design mentor, Perennia continued production and assembled all the florals needed for the ceremony and reception. Sacred Heart Church was the site of the wedding ceremony of Kelli and Dan. Graced by large pack baskets of greens, cattails and florals, guests were seated in pews decorated with blue and burgundy tartan plaid ribbons, Scottish Crest brass buttons, greens, berries and floral swags. 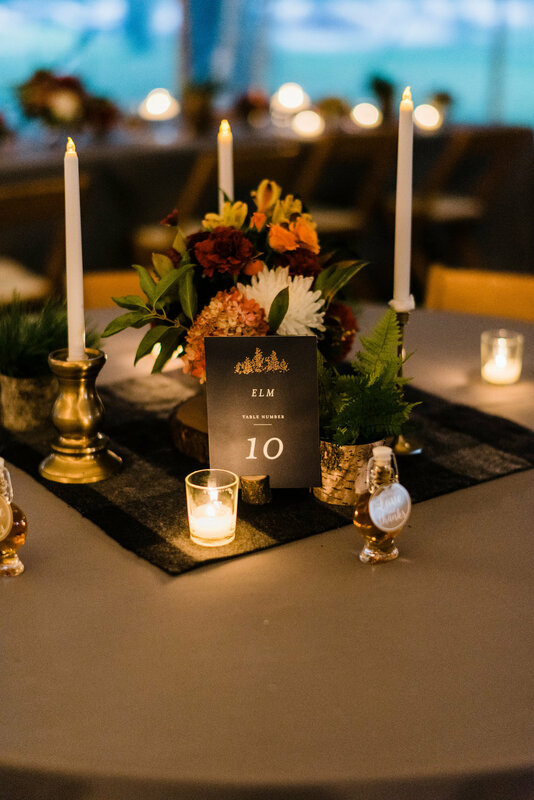 Following the ceremony, the party began at the Robert Moses State Park Pavilion, which had been transformed with floating candles, wool blanket cocktail table table toppers, moss, and string lights. The massive stone fireplace was adorned with large framed botanicals and contained a welcoming, blazing fire. Stone pillars lined the edge of the pavilion These were topped with an elegant display of greens and flowers and served as a dramatic entrance to the dining tent. Dinner guests found themselves seated at tables swathed in charcoal gray linen, blue and gray wool toppers, bowls of flowers, containers of greens and candles in abundance! The head table was draped and surrounded by dreamy cheesecloth. Red Ramsey plaid blankets hung on the chair of the bride and groom and green boxwood wreathes were hung behind them with the same plaid ribbon displayed. The warmth, love and good wishes of the families and guests could be felt as the touching speeches were made and the delicious meal consumed. Reflecting in the flicker of the antique oil lamps and hundreds of candles, Kelli and Dan positively glowed. The dessert table was a huge hit! Family favorites and local specialties kept the guests happy. Of special interest were the little bottles of maple syrup given as favors. This maple syrup collected, boiled and bottled by the Curran family. First dances get us every time and this time was no exception. There was not a dry eye in the place as Kelli and her Dad and Dan and his Mom took to the floor. Soon the dance floor was crowded and stayed that way until the party’s reluctant end! Maureen Peroza is the owner and floral designer of Perennia - Adirondack Events and Floral Design company. A retired elementary school teacher, mother/step mother of 6 and grandmother of 7, she joined with her 4 sisters to make official what they have been doing for years. That is...making memories that last forever through family celebrations and events. In addition Maureen is actively involved in all things Adirondack including biking, hiking, swimming, skiing and gardening. She volunteers with ARISE by helping run the Big Tupper Ski area and is on the board of directors of ARTA which is working to bring a world class recreation trail to Tupper Lake and surrounding communities.